← Timely, no. Tasty, yes. Well, hunting season is over. The freezers are full of meat. For the most part, most of the hunting stuff has been put away. Life is good. And yet… it’s kinda sad. The Deerslayer clan is all about hunting. It’s a weird feeling on a Friday evening not heading out to the hunting camp. It’s time to get down to the business at hand…grinding up the meat that was tossed into gallon bags and frozen to be ground at a later date. Well, the later date is NOW. Throughout the season we’ve packaged up and labeled our meat according to how it will be used. The scrappy, sinewy bits like forequarters that have been set aside for grinding were packaged up in gallon-sized bags of approximately 5 lb. each. Now is the time that we collect all of those bags in order to grind our wild game at home. 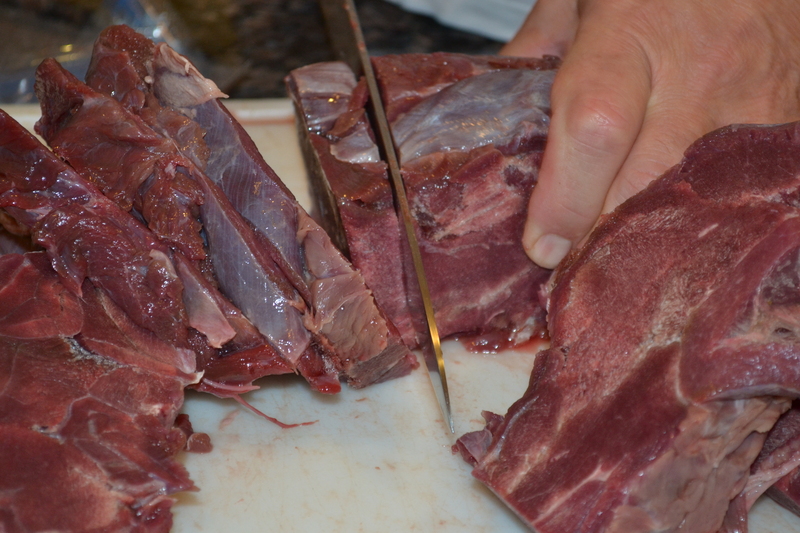 Each year we try to grind about 60-70 pounds of venison (and this year, some nilgai) that will be used in any recipes that would call for ground meat. Lasagna, tacos, picadillo, meatloaf, burgers, soup, or chili would be such recipes. Look at the difference in the fat content of our ground wild pork compared to the nilgai and venison. At this time, I always hope that there is some wild pork to grind as well. It can be mixed 50/50 with the venison to stretch it. It adds a nice depth of flavor and a little extra fat that many people like. Last year, we had lots of wild pork and not as much venison as we wanted. This year, since we have plenty of venison and nilgai, I’m opting to save the scrappy bits of ground pork for maple breakfast sausage. 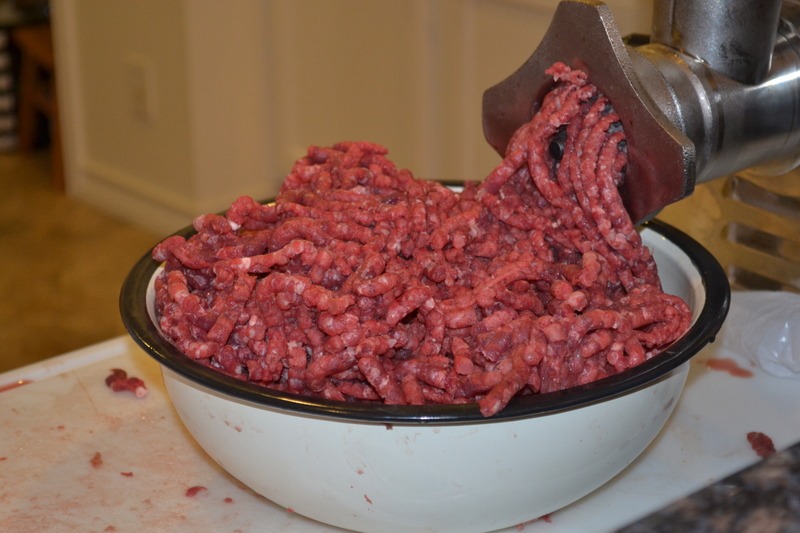 When we first started processing our own meat, we asked for a hand-crank grinder for Christmas. It was so retro and “off-the-grid” and cheap. After much grinding (get it?) and gnashing of teeth (and cursing) we gave up. We didn’t have much success with it. It was really labor-intensive and it kept clogging up with the fascia and sinew. Finding a means to stabilize it was another issue. While there are usually places in the garage that a grinder can be clamped or immobilized, the sanitary environs of the kitchen are really the best bet. 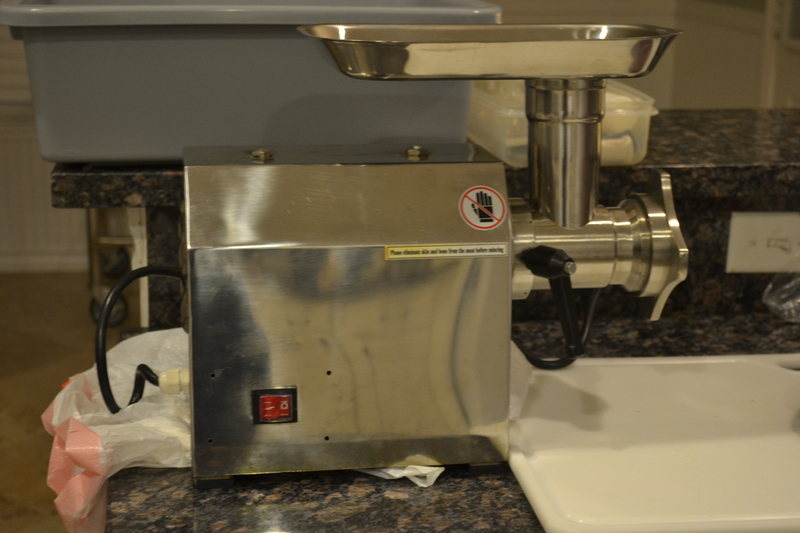 In 2002, we decided to invest in an electric, professional-grade meat grinder. Deerslayer found one online from Northern Tool. It was pricey at around $300 (which has increased quite a bit since then to $579) but when we weighed in the cost of having meat professionally processed, the security of knowing that OUR meat was what we’d be getting back, as well as being in control of the cleanliness of the equipment, well, it was priceless! Our grinder has a 3/4 horsepower motor that gets the job done. Since 2002, the only problem we’ve had is that, once, the on/off switch did need to be replaced but Deerslayer was able to do that pretty easily. The unit came with a couple of blades and two grind discs, one fine and one coarse. I do understand that the cost is pretty daunting. Ours has paid for itself many times over since we bought it. Hunters might consider going in with another hunting buddy to split the cost of a good, commercial-grade grinder. We’ve checked into purchasing foot pedal from Cabela’s for hands-free operation. I’ll keep you posted. I would recommend waiting until the end of the season so that all of your potential ground meat can be processed at once. We polished off about 50 lbs. in one evening after Deerslayer got home from work but it took a couple hours of prep time by the deerslayer’s wife (me) before he arrived. First, several hours before you’re ready to begin or the previous night, set out the meat you want to grind. Leave it in the bags, set it in coolers and let it thaw PARTIALLY. It needs to still be partially frozen when you grind it. That prevents any sinew or fascia from clogging the mechanism or grind discs. 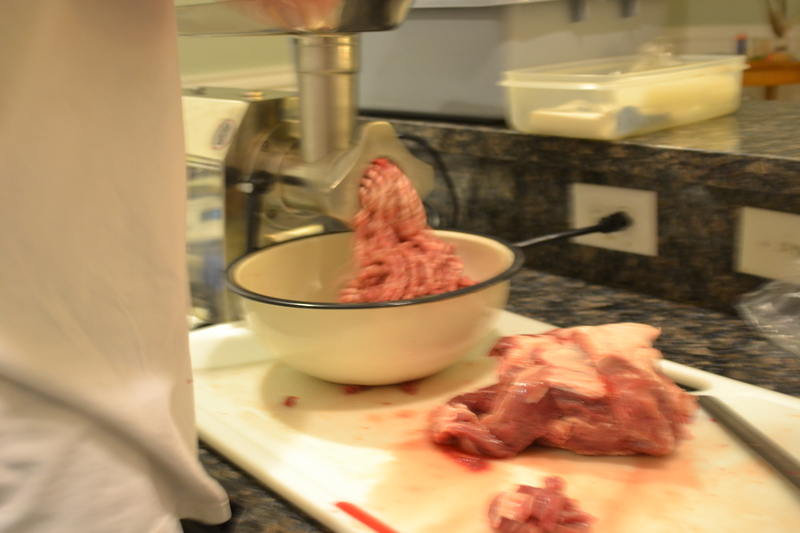 It also prevents the meat from being too slippery and floppy when feeding it into the grinding tube. Sanitize the area, all detachable parts of your equipment and any parts that will come in contact with the meat, a large cutting board, a large serrated knife or meat saw, and containers for moving meat from one station to another. I recommend having two stations (and a worker for each), one grinding station and one packaging station. The grinding/cutting station will be pretty spread out, loud and busy. It works better to set up a packaging station in a different part of the kitchen or at least on a different counter where the scale, bags, sharpie, large container of meat, and filled bags can be arranged. Meat should be semi-frozen when it is ground. It needs to be cut (with a serrated knife or meat saw) into pieces that will easily fit into the grinding tube. We used an enamelware metal bowl to catch the meat. 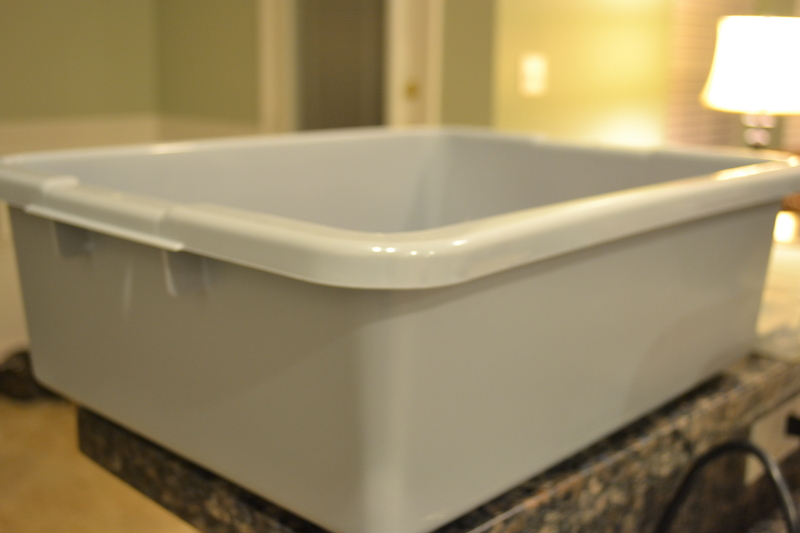 Once the bowl is full, transfer the meat into a larger container that can transport it to the packaging station. 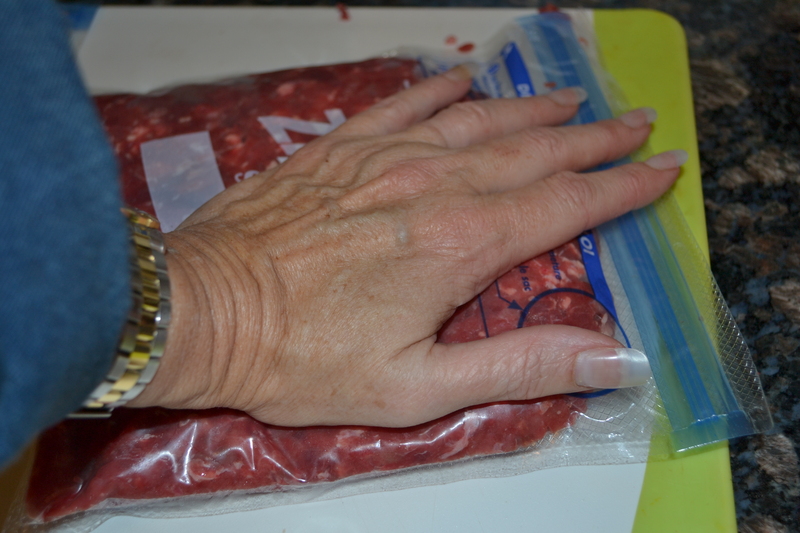 I package up the ground meat in quart-sized zip-lock freezer bags. 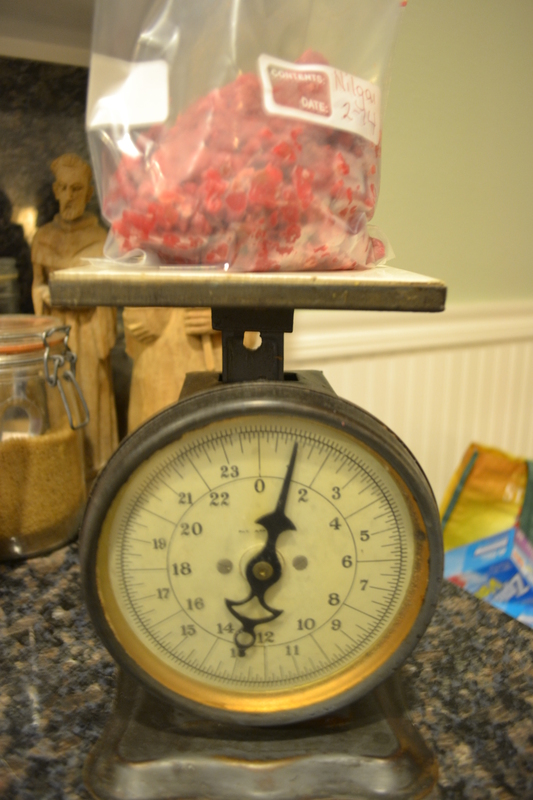 I weigh it out in one-pound packages, enough for any of my recipes. More guests? Two bags. Easy Peasy. Usually, I label and date all my bags with Sharpie before I fill them. I noticed, however, that I neglected to do it in the photo above. It’s easier if you do it befor the bags are filled. 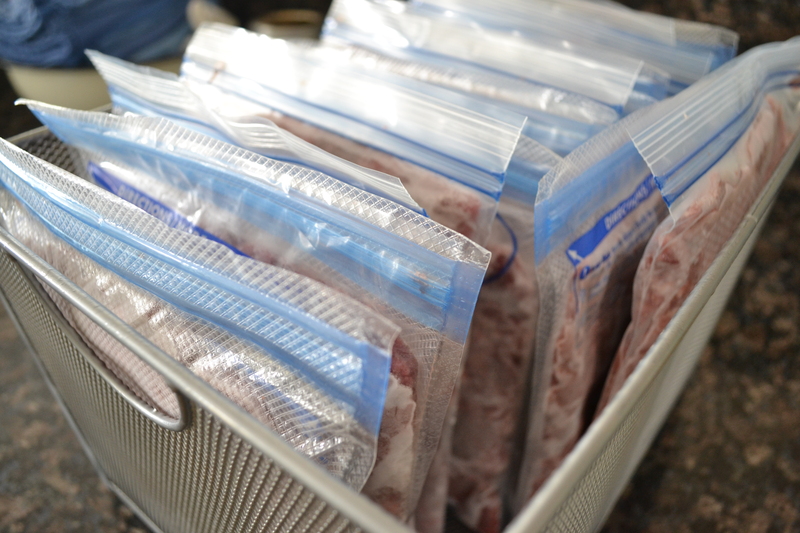 Finally, flatten the bags full of meat to remove most of the air and to make them easier to store in the freezer. 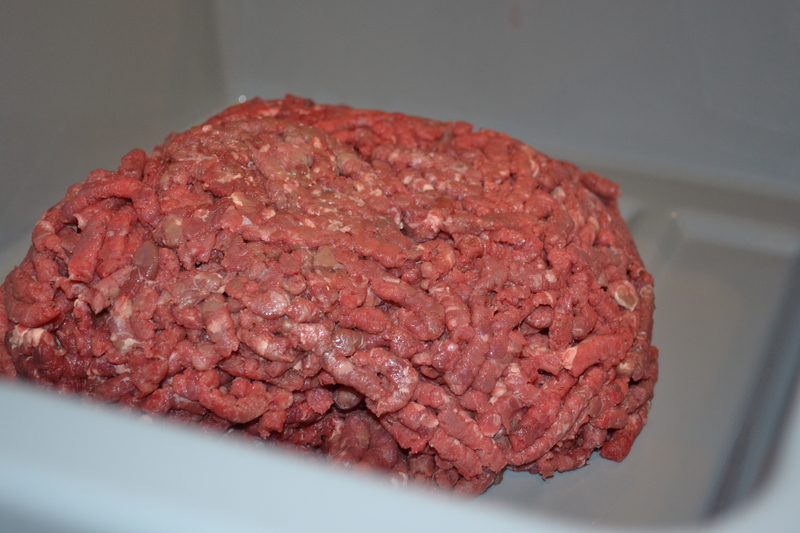 Take several flattened bags of meat, lay them in a single layer on a cookie sheet and place them in the freezer. It flash freezes the meat, prevents the bags from sticking together, and allows the bags to stack nicely in the freezer. The metal basket fits nicely on the freezer shelves and holds 14 lbs. 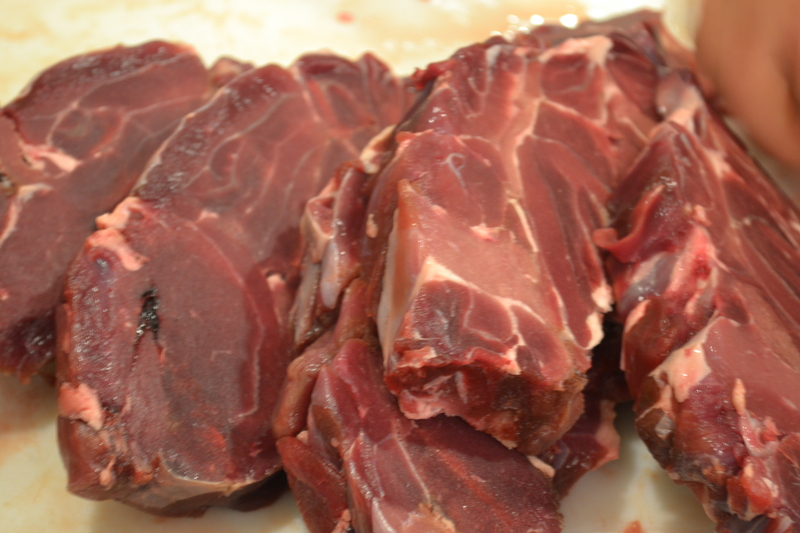 of packaged-at-home ground venison, pork, and nilgai. I really like the idea of the mesh metal box. Our chest freezer is a tumbled mess of reusable grocery bags right now- something more rigid would be nice. And it would be nice to have a system going when we purchase a second freezer to hold the bear we might get this fall. I’m hoping we can get an electric sausage stuffer soon, since we make a decent amount of sausage each year. Our manual one is the pits. Wow that is a lot of meat. I have never hunted before but after reading you post I gather it must be interesting and sort of becomes an activity that you soon start missing…I love the way you pack the meat so neatly and well labelled too. I wish you a happy carnivorous life. I’m a carnivore too! Thank you very much. Wild game is some of the most healthy food out there. Thanks for checking out The Deerslayer’s Wife.